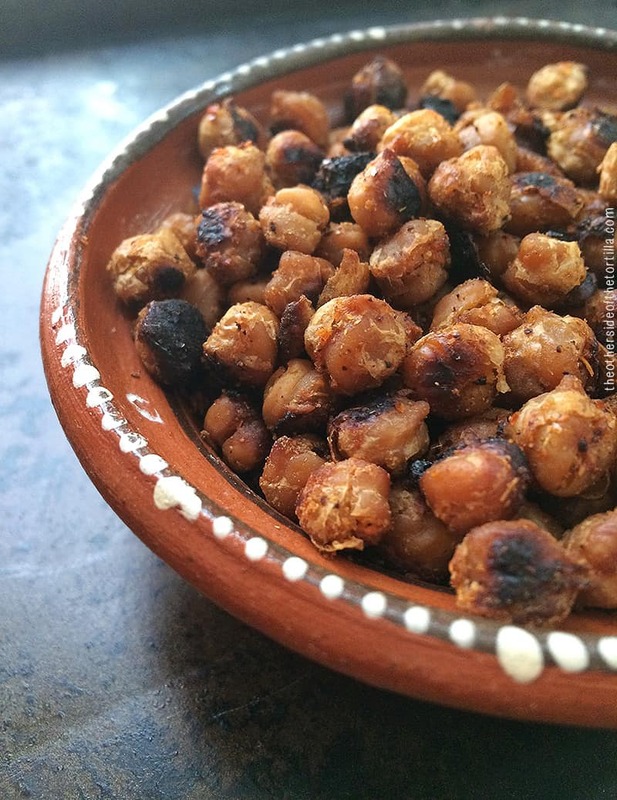 Roasted chickpeas (also known in Spanish as garbanzos) with Tajín, lime juice and cumin is an easy, healthy snack that’s also naturally gluten-free and vegan-friendly. This is a great alternative to mixed nuts because the roasted chickpeas are crunchy, tangy, salty and have less than half the fat per cup. One cup of oil-roasted mixed nuts has about 72 grams of fat, while oil-roasted chickpeas have only about 31 grams of fat (which comes almost completely from the oil). I prefer to use safflower or grapeseed oil, which are great for cooking with high heat, but you can also substitute canola oil if that’s all you have handy. 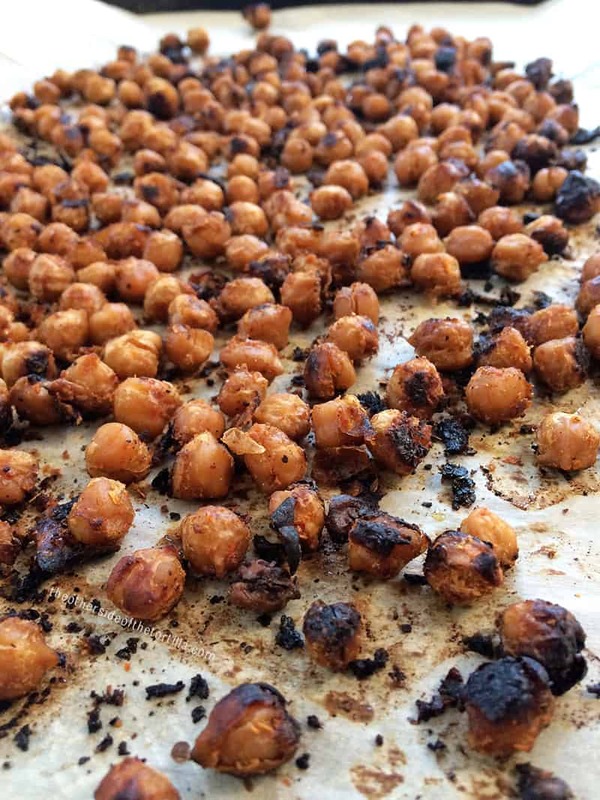 Just keep an eye on the chickpeas as they roast. Canola oil has a lower smoking point than grapeseed or safflower oil at 400 degrees Fahrenheit, so you should reduce the heat to 375 degrees Fahrenheit if using canola oil, and extend the baking time by about 5-10 minutes or until the chickpeas are sufficiently browned and crunchy. Grapeseed oil should have a smoking point of 450 degrees Fahrenheit, and safflower oil should have a smoking point around 510 degrees Fahrenheit. As smoking points can sometimes vary, you should always read labels to know the smoking point of the oil you’re buying. I’ve also used Tajín habanero to make this recipe a little spicier; just reduce the amount of Tajín to 1.5 tablespoons to start and add more to taste. Chickpeas, safflower or grapeseed oil, ground cumin, freshly-squeezed lime juice and Tajín make for an awesome, crunchy baked snack that's got less than half the fat of mixed nuts per cup. Drain and rinse chickpeas in a colander and set aside to drain any remaining water. In a bowl, whisk together 2 tablespoons safflower or grapeseed oil, the juice of half a medium-sized lime, two tablespoons Tajín and 1 teaspoon of ground cumin. Add chickpeas to the bowl and use a spoon to gently stir to coat. Line a baking sheet or jelly roll pan with parchment paper and spoon dressed chickpeas onto the baking sheet in a single layer. Bake on middle rack of oven for 25-30 minutes. Halfway through the baking time, use a spatula to gently move the chickpeas around on the baking sheet so they don’t burn too much on one side. The oil should be completely dry and evaporated when you take them out of the oven, and the chickpeas should be mostly crunchy.